Why do Americans put off car maintenance and repairs? Not a long time ago we posted an article about the best and worst states for working on a car and how hard it is to find a mechanic you can trust who will not cause additional damage to your precious car. Most people don’t know how to fix their cars and often are not even aware there is something wrong with their vehicle. And given how difficult it has become these days to find a trustworthy and reliable car mechanic, the majority of Americans defer car repairs for as long as possible. There are more reasons why Americans are not in a rush to take their four-wheelers to a repair shop. Getting a car fixed can cost you a pretty penny, especially if you hire a mechanic every time you feel that your ride is not running right. It’s understandable. Cars require a lot of care and attention, and some of us… well … are too busy with our lives, and, let’s be honest, often find ourselves lazy when it comes to doing car maintenance and repairs at the right time. Add the fact that auto repairs can drain your bank account fast, and you will get the idea. According to a report by the American Automobile Association (AAA) published on October 8, 2015, 35 percent of Americans “skipped or delayed service or repairs that were recommended by a mechanic or specified by the factory maintenance schedule,” consequently raising the number of roadside breakdowns that would have been easily prevented if everyone adhered to a vehicle maintenance guide and listened to their mechanic’s advice. As you can see, regular oil changes, tire rotation, timing belt replacement, brake inspection, PCV valve replacement, changing plugs, filters, etc.8,000+ ., are some of the must-dos every car owner should follow to save money in the long run and extend vehicles’ lifespan. 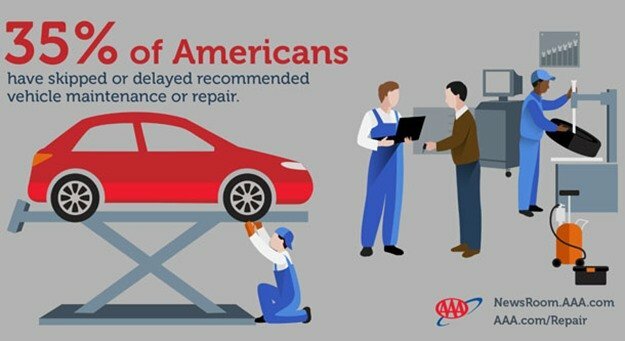 “According to a survey of AAA’s certified Approved Auto Repair shops, consumers that forget or ignore recommended maintenance ultimately pay higher repair costs,” says John Nielsen, AAA’s managing director of Automotive Engineering and Repair. “These repair facilities estimate drivers can save an average of one hundred dollars per visit simply by properly maintaining their vehicle,” Nielsen adds. 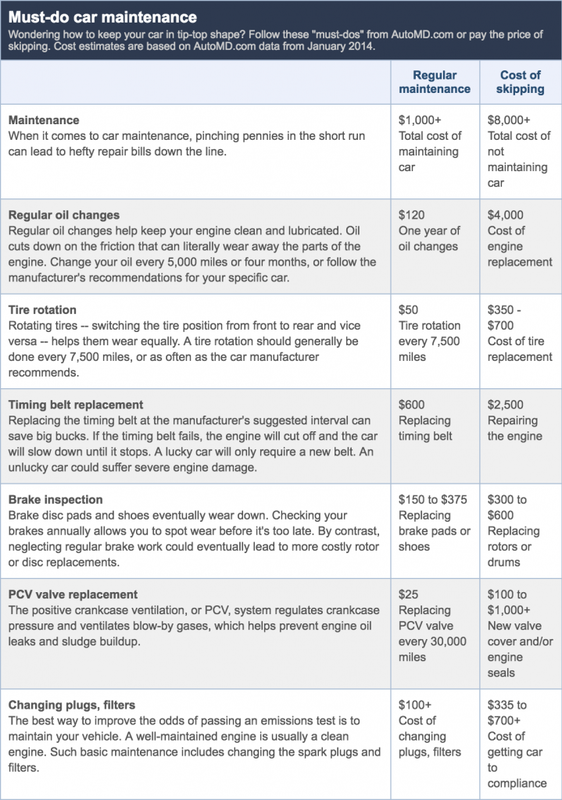 The 2014 AutoMD report shows that the car maintenance cost amounts to $1,000+ per year if you do it regularly while putting off routine service and repairs can cost 8,000+. What a difference! You see that skipping maintenance simply does not make sense. Eventually, you will have to get your car fixed; therefore, to avoid getting stuck with a hefty auto repair bill, keep an eye on your four-wheeler, do the regular check-ups, change the oil, replace the PCV valve when needed, etc. Compared to their European counterparts, Americans are guilty of not following the car maintenance “must dos”. Naturally, people take care of their vehicle during the first few months following its purchase; and as the novelty wears off, drivers start to skip routine maintenance. This is not true for car guys or gals, though. They are always vigilant with their cars and are guilty of religiously checking their rides up even when there is no need for it. Sometimes, it’s because a car guy hears a weird engine noise or a car gal has a dream her car broke down in the middle of a highway. Car guys and gals always find a reason to pop the hood open. Curious to see, if you are a true car guy or gal? Read this article. Automotive repair is a huge industry not only in the United States but all over the world, and the number of auto-mechanics, whose noble intentions are little to none, is getting “too damn high” as Jimmy McMillan would say. “Auto repair is a huge $135 billion industry, and fed by the advancing age of the average car on the road; it’s growing 3.2 percent annually. That’s despite drivers’ growing suspicion that they’re getting ripped off—27 percent report problems with their mechanics in a 2012 Consumer Reports survey,” according to a CarTalk article. Automotive batteries typically last between three and five years, with reduced battery life in hotter climates. To avoid an unexpected battery failure, AAA recommends that drivers have their vehicle’s battery tested when it reaches three years of age and on an annual basis thereafter. According to a recent survey, two-thirds of Americans have never had their car battery tested prior to their vehicle failing to start. AAA’s Mobile Battery Service offers free battery testing to AAA members. Keeping tires properly inflated and routinely checking tread depth is critical to safety, yet AAA found that 60 percent of Americans do not check tire pressures regularly. Tire pressures, including the spare tire, should be checked at least once a month, and when tread depth reaches 4/32” AAA recommends replacing tires. Additionally, while locking lug nuts are helpful in preventing tire theft, missing keys prevented roadside assistance technicians from changing 21,000 tires in 2014. AAA recommends storing the locking lug nut key with the spare tire or in the glove box. Despite the rising popularity of Passive Keyless Entry systems, AAA has not seen a significant reduction in the number of calls related to drivers being locked out of their vehicle in the last decade, proving that it is difficult to prevent this common mistake. Americans hold on to their cars longer these days. The average time of cars on the road has climbed to 11 1/2 years. Therefore, skipping routine maintenance and repairs will eventually take a toll on a car and its irresponsible owner’s wallet. It can become a real nightmare. Drivers who have been slacking off on a regular car service will have a hard time selling their vehicles, should they decide to do so. The truth is, no one wants to get stuck with a vehicle that will be spending more time in a mechanic’s garage than on the road. You see, taking good care of your four-wheeler is always a good idea, even if you are not planning on keeping your car for a long time. Maintaining your vehicle “in good health” will also prove you a responsible car owner and will set you apart from everyone else. If finding a great mechanic you trust is the main problem, then do something about it. Not all mechanics are going to try to take advantage of you. There are great and trustworthy auto mechanics out there that will take good care of your car and will not overcharge or upsell you. Start looking for them now. Do your research, ask around, take advice from the people you trust. Congratulations if you have already found your repair shop. Now, remember to stick to the plan and don’t skip car maintenance. It always pays off. Do you maintain your car regularly? When was the last time you got it fixed and for what reason? Let us know in the comments below.